Through its many innovations, the new SIEMENS SIMATIC PLC S7-1500 controller sets new standards for maximized productivity. This remuneration small-series machines as well as complex installations that place high demands on speed and deterministic. The SIEMENS SIMATIC S7-1500 is faultlessly integrated in the Totally Integrated Automation Portal (TIA Portal) for maximum engineering efficiency. 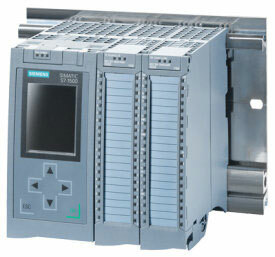 The SIEMENS SIMATIC PLC S7-1500 is modularly structured, with scalable functionality. • Equipment and communication modules as required. • The SIEMENS SIMATIC PLC S7-1500 is the modular control system for a variety of automation applications in discrete automation. • The modular and fan-free design, simple implementation of distributed structures, and convenient handling make the SIEMENS SIMATIC PLC S7-1500 the cost-effective and user-friendly solution for the most diverse tasks. • High industrial strength thanks to high electromagnetic compatibility and high resistance to shock and vibration enable universal use of the SIEMENS SIMATIC PLC S7-1500. M/s Grups Automation, Exporter and Manufacturer of High Quality SIEMENS SIMATIC PLC S7 1500. We have successfully completed installations and can provide better after sales services in following countries / Cities.